Go to early service and bee-line to the Baker Farm in Marion, Mi for a great time and education! Frustrated over political stalemates? You are not alone! There is a rich history to refer to and to use to change the political scene. Come and learn from nationally acclaimed speakers who have done it! 12:30: Our own “DNR approved” hog will be roasted and served for lunch, along with some of our pasture raised chickens. 1:30: KrisAnne Hall and Sheriff Richard Mack take the mic. KrisAnne Hall is an attorney and former prosecutor who travels the country teaching the Constitution and the history that gave us our founding documents. KrisAnne will connect the dots for you like no one else can! Host of The KrisAnne Hall Show, she pulls no punches, puts Liberty First and gives no quarter to those who hide behind party labels. Like no other host KrisAnne you will tell you what the founders had to say on today’s relevant issues. Learn more at KrisAnneHall.com. Author/speaker and former Sheriff Richard Mack has served in a wide variety of roles over the course of his nearly twenty year career in law enforcement. During his tenure as sheriff, federal officers informed the sheriffs of the state that they would be required to enforce the so-called “Brady Bill” and run background checks at their expense under the law. Mack and six other sheriffs from across the country challenged the constitutionality of the Brady Bill and fought it all the way to the United States Supreme Court, where they won a monumental decision for freedom in a landmark 5-4 split decision based on the Tenth Amendment to the United States Constitution. 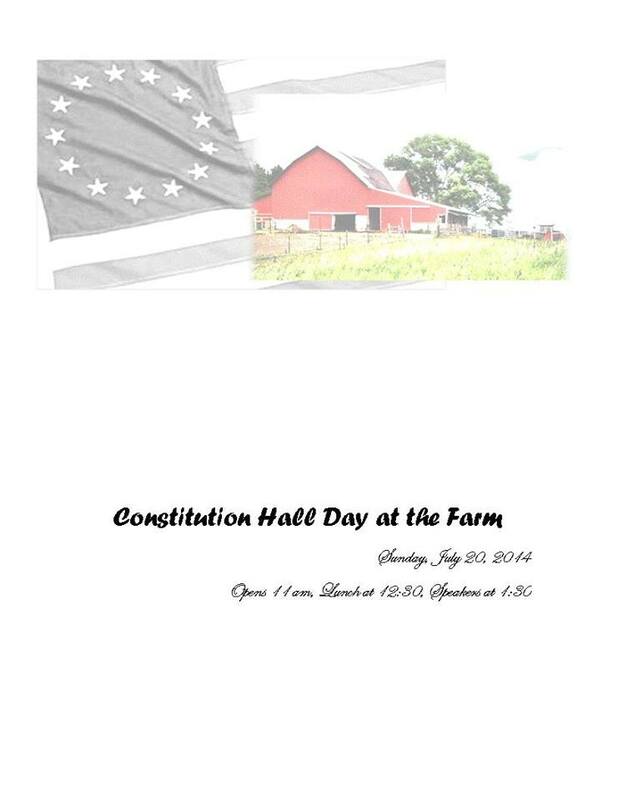 Sheriff Mack will talk about the Constitution and a Constitutional Sheriff’s role. Come join us for a fun and educational afternoon on the farm! Freewill donations accepted to help us bring these incredible speakers to northern Michigan. More Information at the Bakers Green Acres website. Shall I presume that AG Bill Schuette, and the MI-GOP's flagship, our very own Governerd Rick Michigan, hailing from taxpayer subsidized "piggy bank" Moscow on the Huron-Peoples Republic of Ann Arborstan, will be in attendance? Orr, is the MI-GOP's highly touted manly bastion of conservative values, Lt. Governerd Brian Puss-cake, will be in attendance? Everything suggests that the aforementioned diseased minds soaked in treachery and disdain towards Party Principles and Platform need enlightenment from Mrs. Hall, and Sheriff Mack, as much, if not more so than Schuette, Snyder, and Calley, view the peons - their electorate.